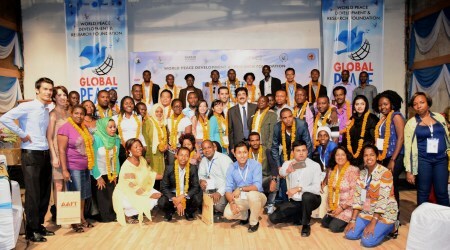 Noida: The delegates from 30 countries of the World were the participants in the Global Peace Summit who were impressed by the initiative taken by World Peace Development And Research Foundation. â€œWe are media persons and we feel that our responsibility towards nation building is much more than any citizen of the country. We have to take initiative in every angle of life so that many can follow the path of progressâ€ said Sandeep Marwah five times World Record Holder in media and president of WPDRF. The second session of the summit was coordinated by Sandeep Marwah and speakers like Ashok Tyagi Secretary General of ICMEI and film maker, Dr. Gopal Ji Chairperson of Global Yog Alliance, Dr. V.K. Goswami Scientist from NASA and Chairperson IFTRC, Dr. K.D.Gupta environmentalist, Acharya Satyendra Narain President Confederation of World Religion and Dr. Nidhi Trehan Pro Vice Chancellor Roma University were on the board. All the participants were given an opportunity to speak on the subject. More than 60 delegates from 30 countries of the World participated in the conference and shared views on peace. Later Sandeep Marwah handed over the life membership of World Peace Development And Research Foundation along with the memento of the summit to every foreign delegate present there. The foreign delegates coming from 30 countries include Germany, Nepal, Sri Lanka, Afghanistan, Bahrain, Niger, Nigeria, Uganda, Sudan, Tanzania, Morocco, Cameroon, Ukraine, Russia, Myanmar and Indonesia.